The Russian foreign ministry on Tuesday said two plane loads of Russian “specialists” who landed in Venezuela on the weekend did so as part of a military-technical cooperation agreement between the two countries. 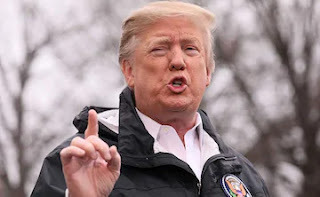 US President Donald Trump said on Wednesday that Russian soldiers needed to leave Venezuela, days after a Russian military contingent arrived just outside of Caracas, saying “all options” were open to make that happen. “Russia has to get out,” Trump told reporters during a meeting with the wife of Venezuelan opposition leader Juan Guaido. The arrival of two Russian air force planes containing nearly 100 troops in Venezuela last weekend was a provocation, US Vice President Mike Pence said on Wednesday. A Russian military contingent that arrived in Venezuela over the weekend, drawing US condemnation, is believed by the US government to be made up of special forces, including “cybersecurity personnel,” a US official said on Tuesday. The official, speaking on condition of anonymity, said the United States was still assessing the Russian deployment, which Washington has called a “reckless escalation” of the situation in Venezuela.